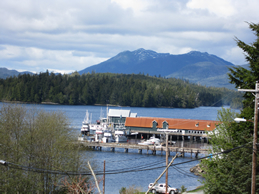 Prince of Wales Island is located 600 miles north of Seattle, Washington in Southeast Alaska near Ketchikan Gateway Borough, and can be reached via the Inter-Island Ferry Authority that runs along another scenic byway, the Alaska Marine Highways All American Road. The island is 135 miles (215 km) long, 45 miles (72km) wide and has an area of 2,577 sq mi (6,675 km), about 1/10 the size of Ireland and slightly larger than the State of Delaware. Approximately 6,000 people live on the island. Communities include; Point Baker, Labouchere Bay, Port Protection, Wale Pass Coffman Cove, Naukati, Thorne Bay Klawock, Kasaan, Hollis, Craig and Hydaburg . There are four federally-recognized Tribal Governments on Prince of Wales Island: Craig Community Association, Hydaburg Cooperative Association, Organized Village of Kasaan, and Klawock Cooperative Association. 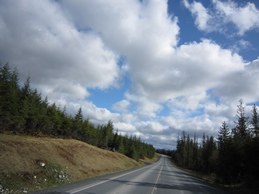 Caution: More than 1,500 miles of roads reach into Prince of Wales Island. About 200 miles of paved road girdle the island. More than 50 miles of improved gravel roads extend along shorelines and into the mountains. Logging roads criss-cross the forest. You can drive a standard car that entire distance. To explore logging roads, use a four-wheel drive or sturdy SUV. Be sure your spare tire is in good shape. Watch the gas gauge and mile markers: fuel is available in Craig, Klawock, Naukati, Thorne Bay, Coffman Cove and Whale Pass. Bring your cell phone’s car charger. Rent one of the numerous Forest Service Cabins on the Island for a back country adventure. Some cabins are on lakes, other on streams. Some are on short trails near the road system. Plan a day trip for wildlife viewing, maps available at Fish and Game website. 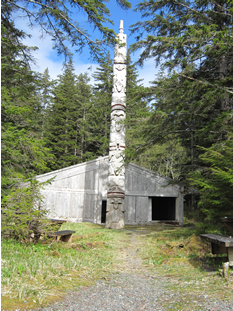 Stop at one of the Totem Pole parks in Klawock, Hydaburg and Kasaan. There are also poles in Craig. Here about the artists for thousands of years have used tools of bone, shell and steel to bring legends and stories out of Cedar trees. Visit the northern end of the island to see El Capitan Caves and Karst landscapes. Rent an ATV for the backcountry experience, route maps are available through the USFS Ranger District. Visit the third Alaska hatchery set up to augment natural salmon runs, located in Klawock. 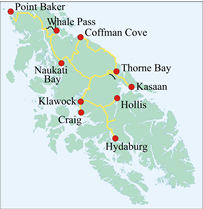 Map out an adventure on our scenic routes on the island with stops at Streams, Rivers, Estuary’s on your way to one of the many small communities on the Island for local flavor and views of peaks, forest scenes and beautiful bays. Plan your driving trip around Island events such as the Thorne Bay King Salmon derby, Craig-Klawock Salmon derby, Prince of Wales Island International Marathon, or the famous Skunk Cabbage Festival. Open Daily: Monday - Friday, 8:00 a.m. to 4:00 p.m.